Who doesn't want the comfort of eating fast food meals at home and just order via hotline? I am a guilty mama here. Because of the every afternoon raining, I skip going to city to order some foods for us both. And today right after the laundry I feel like I am hungry and craving for some spaghetti. But who am I gonna call? Good thing that I read from Coffee Shots and Ramblings the latest free delivery hotline for Globe subscribers. Perks of a Globe subscriber indeed. But before that, I confirmed it first if it's really free to call or need to have regular load to be able to place an order. And yes, it's free. So this afternoon, I dial up #87000 and place my order. The minimum amount for food delivery is Php200. I asked them if they also cater the PWD discount since Isobelle does have an ID and we use that for Greenwich. This is what I love the most with Jollibee delivery. They allowed me to use the PWD ID and processed my order even if the discounted sale is below the Php200. How is that so? My experience with Greenwich Delivery before is that they asked me to add another order so that my amount due would suffice the minimum amount for delivery. I hate to admit that it shouldn't be like that because I don't want to add up another meal but they won't be able to process my order because it doesn't work with their cashier/counter and won't print the receipt either. Poor thing. That's minus 1 point with them even if I rated them most convenient fast food delivery here at Batangas City. But with Jollibee, I only pay for the amount due of my order, without the need of adding more because I already reach the minimum amount required. So the ranking now is changed. Aside from that, if I have to compare the attentiveness and courteousness while asking for my order up to delivering it at home, I can say that Jollibee scored higher compare to Greenwich. One more thing, it is much faster. They told me that a 45 minutes waiting time may be expected. So if you are gonna compute the time difference it's not yet 45 minutes plus the time of placing an order is already included. While at Greenwich it took me 45 to an hour window clock. Now that I've learned about this I might always place a food delivery with them. If you are also a Batangas City resident, you can contact them through landline, hotline and SMS. 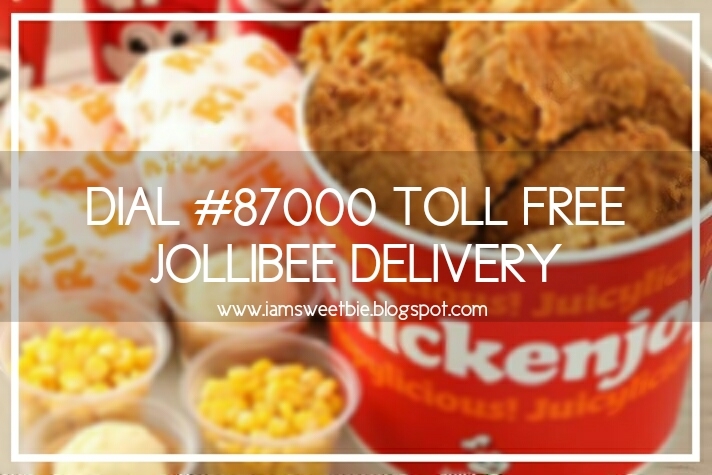 Hungry or Craving for a Jollibee Langhap Sarap Value Meals? 📱 send an SMS "DELIVERY BATANGAS" to 0908-868-7000 for Smart, Talk n Text, Sun and 0917-868-7000 for Globe and TM. An agent will call to get your order once an SMS is received. Disclaimer: I am not affiliated with Jollibee Food Corp nor am J compensated to write about this. This is purely based on my experience as their customer.